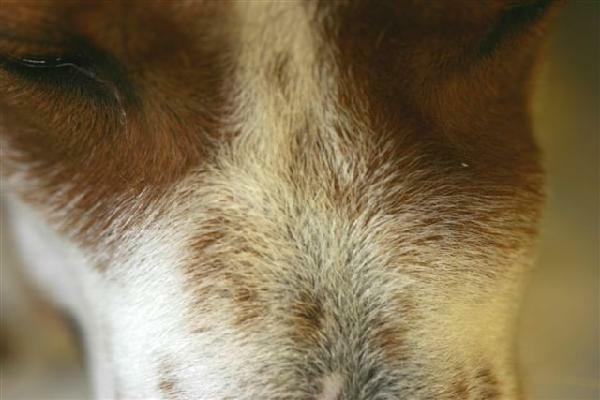 Dentigerous, follicular and radicular cysts are diagnosed frequently in dogs. Dentigerous cysts are particularly common in small breeds of dogs however, they occur in all breeds. Unerupted or embedded teeth are often found within these oral cysts. Oral cysts are benign lesions however, as they expand from continuous fluid secretion, severe local destruction occurs. Bone, periodontal tissues and teeth can be destroyed by oral cysts. How are oral cysts diagnosed? Every time a tooth appears to be missing, a dental radiograph should be taken to determine if the tooth is truly missing or whether it may be unerupted or embeded subgingivally. Embedded teeth can result in oral cyst formation. Dental radiographs also help confirm that the lesion is a cyst. Dental radiography provides strong evidence toward the diagnosis of oral cysts. Confirmatory diagnosis is established from histologic (tissue) evaluation by a pathologist. These lesions have secretory epithelial lining. Why are oral cysts clinically significant? Oral cysts are clinically significant because they often cause severe local destruction of teeth, periodontal tissues and bone. This local destruction can weaken the jaw and contribute to jaw fracture. The clinical views of oral cysts (below) demonstrate that they frequently appear as fluid filled oral masses in the mandibular premolar region. These cysts typically contain embedded teeth or dental remnant tissue and we consistently find that they are tremendously destructive! The earlier they are diagnosed and treated, the more the localized destruction can be minimized. We have also managed patients with oral cysts in the incisive and maxillary regions. Clinical photographs illustrate various presentations below. How can oral cysts be prevented? 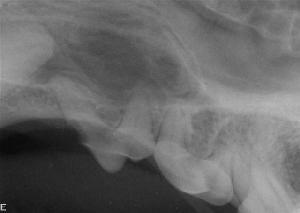 Oral cysts are particular common in small breeds of dogs from our clinical experience. 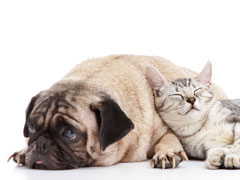 The most likely reason oral cysts are more common in small breeds is due to dental crowding, which contributes to problems with tooth eruption. Embedded teeth are frequently associated with dentigerous cysts. These cysts can be prevented by performing a thorough oral exam during every physical exam. Early recognition of missing teeth is important. To recognize missing teeth, the observer must be familiar with the normal number of teeth. Dental radiographs must be used to confirm the tooth is truly missing, and not embedded subgingivally. Dental radiographs will allow for the diagnosis of embedded teeth as well as early cystic developments. Early extraction of unerupted or embedded teeth can prevent dentigerous cyst formation. Early recognition and meticulous treatment of these cysts can prevent the widespread destruction caused by them. How are oral cysts treated? Oral cysts are treated surgically. The entire lining of the cyst must be removed, or the cyst will likely return. If at all possible, we try to excise the entire cyst "en-bloc" to avoid leaving the secretory lining within the defect (see clinical photos below). In every case, the final surgical defect is curetted free of tissue and debris. Teeth embeded within the cyst as well as adjacent extracted teeth are always submitted with the cystic lining tissue for histology. Confirmation of the presumptive diagnosis of "oral cyst" must be confirmed to rule out potentially life threatening malignant oral tumors. Additionally, radicular cysts, periapical cysts, granulomas and abscesses may need to be ruled out. Each case must be managed based on the dental radiograph findings. The adjacent teeth must be evaluated for vitality (life). Non-vital (dead) teeth must be treated by root canal therapy or by dental extraction. The destructive nature of oral cysts makes dental extraction a higher risk for jaw fracture. Extreme care is required to avoid complications. 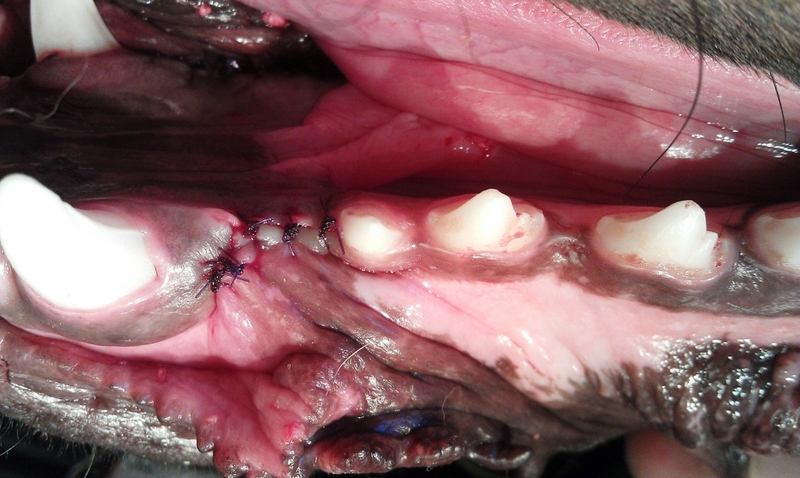 For animals with severe local bone destruction, bone grafting should be performed. An allograft is very suitable for alveolar crest augmentation to improve jaw strength. Other osteoconductive or "osteopromotive" materials may also be used. Clinical photos from referral cases managed by Dr. Kressin. These specific cases were chosen to illustrate important procedures required in treating oral cysts! The importance of dental radiographs. Here we have a supernumerary lower 1st premolar. It was identified underneath the gum line with dental x-rays. A cyst was already starting to form. The tooth was removed and the site sutured. Typical dentigerous cyst presentation in mandibular (lower jaw) premolar region. Oral (dentigerous) cyst as viewed from above. the cyst, and for percussion of the fluid within it. pool of pink fluid. Viewed from above. Cystic lesion viewed from behind. (tissue analysis by a pathologist). This case was in the typical location with an atypical appearance. below this firm protrusion of gingival tissue. a typical presentation with oral cysts. Cystic defect viewed from the side. View of cyst from above. after placement of a graft material. that this was a dentigerous cyst. Top view of blood filled cystic fluid. Initial surgical isolation of cyst. Fluid has exuded from the cyst. Notice the imbeded premolar tooth. Premolar tooth attached to the lining tissue. The defect was curetted 360 degrees. to placement of bone graft material. The following oral cyst was very descructive and associated with the upper premolar and molar teeth in the upper maxillary bone! substantial fluid filled swelling (oral cyst). Alternate view from the bottom of cyst. the fourth premolar and molar teeth. a tooth-like structure was identified. Severe cavitational destruction of the maxilla. Severe left facial swelling in a 5 year old dog. Matisse; 5 year old dog with a severe left side facial swelling. Dental radiograph left premolar area. Alternate view of left facial swelling. View of swelling inside the mouth. Second premolar tooth within fluid Premolar tooth within very deep cyst. The embedded premolar was removed. cystic cavity; 32mm x 15mm x 14mm. Surgical defect closed with 5-0 Monocryl Suture. 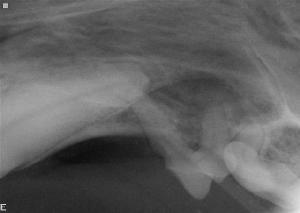 French Spaniel at seven months with unerupted, embedded lower first premolar teeth on both sides. Embedded teeth create a risk for dentigerous cyst formation. Missing teeth must be evaluated with dental radiographs to identify unerupted, embedded teeth! Lower right first premolar missing. Lower left first premolar missing. teeth are called embedded and create a risk for dentigerous cyst formation. Horizontally embedded first premolar. Horizontally impacted first premolar. Lower right first premolar exposed. Lower left first premolar exposed. Right side surgical defect sutured. Left side surgical defect sutured closed! 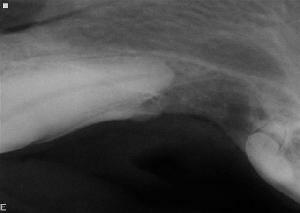 Post surgical dental radiograph Embedded first premolar extracted!